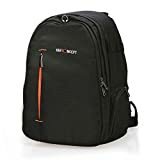 Travel Backpack – 7 Internal reinforced removable dividers,adopt 24cm telephoto lenses, offers multiple storage options for carrying Canon/ Nikon/ Sony/ Pentax/ Fujifilm/ Panasonic/ Leica SLR DSLR cameras, lenses, tripod, flashes, 10-12″ tablet laptops any other camera accessories. Top Carry Handle – Fits in the overhead compartment of most commercial aircraft worldwide, 1000D black Shock-Proof Material, waterproof / wear resistant / scratch resistant /tear resistant nylon. Safe Guarded – The bag is with professional 2-way zip, you can add the optional anti-theft code lock( not included) to make it safer. Also, back opening Anti-theft, zipper with code lock, double anti-theft. Humanized Design – Inner cover mesh prevents gears from falling when opening, considering your wearing experience, the bag is with ergonomic design which includes padded back support and a customizable strap for comfortable extended use. This K&F backpack with large main opening offers multiple storage options for your DSLR cameras, lenses, tripod, flashes and other accessories. It adopts durable black 1000D100% Waterproof Nylon and Waterproof double zippers, ample interior storage.Protective foam dividers are fully customizable for your gear.Ventilate and shockproof design, make you feel comfortable. This entry was posted in Discount Photography and tagged 1012, Backpack, Camera, Cameras, Canon, Cover, flashes., Fujifilm, K&F®Concept, Laptop, Leica, Lenses, Nikon, Organizer, Panasonic, Pentax, Rain, Rucksack, SLR/DSLR, Small14.95''X10.62''X6.67'', Sony, Tablet, Tripod by Ball Photo. Bookmark the permalink.